When she reflected upon it, ” The more she thought about the mysterious origins of Rinnrivin Di’s operations, the deeply they unnerved her” (160). 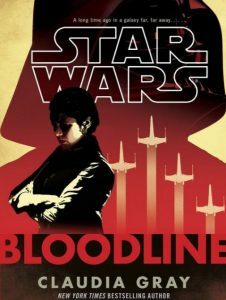 Indeed, “Whatever the real power was behind Rinnrivin’s cartel, its reach had to go almost past anything Leia could imagine…” (161). Even though Princess Leia is able to neutralize Rinnrivin Di, there are still plenty of funds that came from him to fund the First Order, as “the riches earned through the smuggling and gambling interests of Rinnrivin’s cartel were helping to refit and rearm the former Imperial fleet, bringing them back to their full power and glory so that they would be once again ready to conquer” (298). It was Lady Carise who had searched for former Imperial officers and their sympathizers among the various subcultures where they might congregate, helping to create the contacts that connected them to the surviving ships of the Imperial fleet. Lady Carise who had encouraged them as they organized from mere malcontents into the burgeoning paramilitary force known as the Amaxine warriors. And it had been Lady Carise who convinced the Centrist leaders in her faction to use the criminal front they’d already established through Rinnrivin Di to hide their funds in order to arm and train the Amaxine warriors. With weapons and training, they could, in time, serve as the shock troops in the initial battles of the great war to come. Never before had Lady Carise spoken those words out loud in her office. The First Order. Someday, the entire galaxy would shout them with pride, but, for now, they were too secret, too sacred, to be taken lightly. That dream was so close to becoming reality – only a few years away, if even that – and protecting it required discretion. Her hope was that “once the Amaxines had caused enough damage and confusion, the First Order, itself, could finally emerge from hiding to claim its rightful place, with the lost vessels of the Imperial fleet as its true fighting force” (226). Maybe it was just as well the Amaxines would no longer be an issue. Hadrassian and her militia had always been too much of a rogue element to fit into the Centrists’ plans for the future. When the First Order emerged, they would want to establish the new law, not create chaos. Besides, the Amaxines had already served a useful purpose, one that eclipsed what little good they might have done as an advance guard for the First Order. They had served as a critical distraction when it was needed most. Now that the Amaxine warriors had taken the fall as Rinnrivin Di’s funders and partners, no one would look any farther into his finances…and trace that money beyond backwater planets to the very heart of the First Order, itself. Even now, the riches earned through the smuggling and gambling interests of Rinnrivin’s cartel were helping to refit and rearm the former Imperial fleet, bringing them back to their full power and glory so that they would be once again ready to conquer. Oh, there were details she didn’t know. Secrets that hadn’t yet been shared with her. But she understood how to interpret shadows. Like, for instance, the disappearance of Brendol Hux, her homeworld’s academy commandant, after the Battle of Jakku. Some said he had only given up – as if such a hero of the Empire would surrender so abjectly. So many people lacked faith. But those who still believed – they were the ones who would resurrect the greatest power the galaxy had ever known. Lady Carise knew how to play the game. She portrayed herself as pretty and frivolous, a woman as interested in celebrity as power, and she did it well. So no one suspected the critical role she played in preparing the galaxy for the return of meaningful authority through the government she and other like-minded people already whispered about as the First Order. Although we don’t know yet if her secession succeeded or if the Centrist worlds were still a part of the New Republic at the time of The Force Awakens and we also don’t know if the Centrist worlds decided to support the First Order or not after the story in this book, we do see from Star Wars Bloodline, that there is significant financial support for the activities of the First Order, as well as some quiet political movement. I am curious to find out what happens for the First Order following Star Wars Bloodline on up to The Force Awakens….